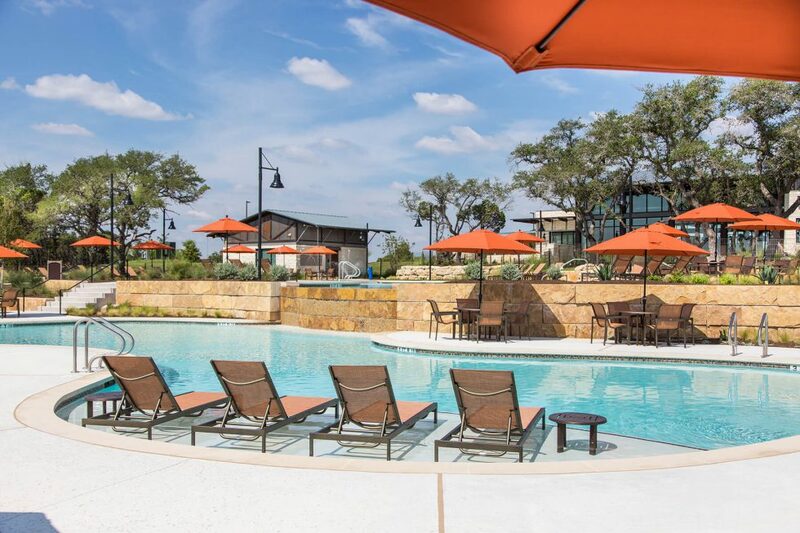 SAN FRANCISCO, California – Headwaters, the new 1,035-acre development in Dripping Springs, Texas (near Austin), has won the 2018 Gold Nugget Award for Best Indoor/Outdoor Lifestyle for a Community. Headwaters developer Freehold Communities accepted the award at the annual PCBC 2018 Gold Nugget Awards in San Francisco, June 28, 2018. PCBC’s Gold Nugget Awards are presented annually to the best innovators in design, planning and development. The competition is open to builders, developers, architects, and land planners with communities and projects across the United States and internationally. With 1,000 lots for homes, Headwaters includes broad expanses of natural habitat, including Barton Creek and five protected hilltops, plus resort-style split-level pool, Wi-Fi café, and eight miles of trails. Gold Nugget judges cited Headwaters’ project description: Headwaters harmonizes unique community amenities with its beautiful natural setting. The Hub coffee bar and co-working space, for example, serves as the main indoor gathering area. Its walls of floor-to ceiling glass offer inspiring Texas Hill Country vistas from a building that feels like it might have served the ranch that originally formed this property. In the same way that these spaces bring the outdoors in, the vast open spaces and parks incorporate the structures of the original ranch building. This approach includes Headwaters’ Star-Gazing Amphitheater – part of its Homestead Park – one of the most distinctive amenities of a masterplanned community anywhere in the United States. Perched atop a protected hilltop in the center of the community are the remnants of the original ranch home of the Townes family built in the last century. It has been partially deconstructed, revealing stone masonry no longer seen today. Joining Headwaters in receiving the Grand Award for Best Indoor/Outdoor Lifestyle were its architects MAI – Marsh & Associates, Inc.; planners: RVi Planning; and interior designers MAI – Marsh & Associates, Inc.